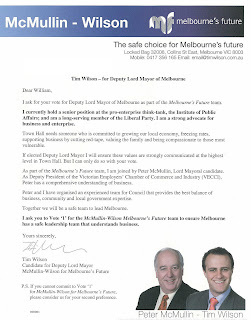 Peter McMullin and Tim Wilson have presented their credentials to Melbourne’s business community. McMullin-Wilson team is without doubt the most experienced and professional team in the Lord Mayor’s race offering Melbourne strong leadership and fiscal management. Tim Wilson, who is a senior consultant at the pro-enterprise think tank “the Institute of Public Affairs” and a senior member of the Liberal Party, has sent out a personal letter to try and shore up the business vote in hope of securing 4,000 votes that otherwise would have gone by default to Robert Doyle. Robert Doyle has run the most lack lustre campaign of all the main contenders, showing contempt and disengagement from the political process. Doyle is relying on the recognition factor. In the process he has undermined and divided the liberal conservative vote that would have normally been allocated to the likes of Peter Clarke (Gary Morgan) Fiona Snedden (Nick Columb). Doyle appears to be coasting, not taking the election or the electorate seriously. He is expected to help top up Catherine Ng, who is being backed by Ted Baillieu, in what is shaping to be a close contest with two main players, Catherine Ng and Peter McMullin. Robert Doyle’s disengagement in the campaign has erroded his initial vote pull expectation. There are some people who think that Doyle may bottom out and receive as low as 12% of the vote. Expectations are that he will attract around 18-20% but that this level of support will not flow on to his Council Ticket which is headed by Carl “jet set” Jetter. The McMullin Wilson letter should give McMullin that extra edge in his campaign. Voting closes at 6:00PM Friday November 28.